Oops - we don't appear to have a video for the ScanMate i1180. 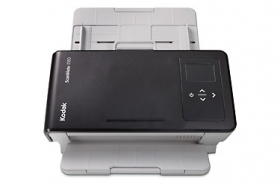 KODAK SCANMATE i1180 Scanners process transactions at the speed of business. At the same time, document capture must stay in sync with current technologies to help businesses remain efficient. Organizations are turning to web-based architectures to speed the adoption of new business applications and minimize support costs. The SCANMATE i1180 Scanner is designed to keep up with these changing technology environments. The SCANMATE i1180 Scanner extends the concept of an intelligent device by embedding Perfect Page image enhancement technology into the device to reduce processing demands on the user's PC, making the i1180 a PC-friendly offering. Plus, the SCANMATE i1180 Scanner is a fully licensed device for the EMC CAPTIVA Cloud Toolkit, making it easy and cost effective for customers or developers using this software development kit (SDK) to write and enable browser-based capture applications. Scan documents and capture information, extract data, and handle documents once. Benefit from an intuitive, icon-based colour interface. Take advantage of associated cost savings. And that's just the beginning. Small, quiet, quick, and intelligently designed, the SCANMATE i1180 Scanner accelerates your processes with seamless technology so you can focus on your business.